Pack Your Suitcase is a puzzle that will put your neurons on the road to a holiday. Take all the objects on the map: hat, sunscreen, buoy... and put them in the suitcase, but be careful nothing should protrude and it is forbidden to sit on it to close it! Many dice will help you improve your ability to pack on different levels. Contents of the box : 4 suitcases, 4 sets of 13 items to fill the suitcase, 30 round cards (Diam. 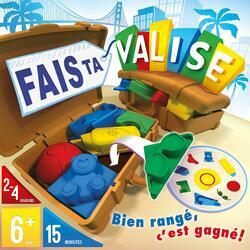 114 mm) of fully illustrated challenges with different levels of play.